Mildew and stains fade quickly and are gone within seconds. 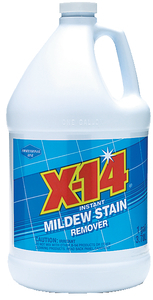 Can be used as a pretreatment and mildew stain remover and preventative for use on outside painted surfaces. 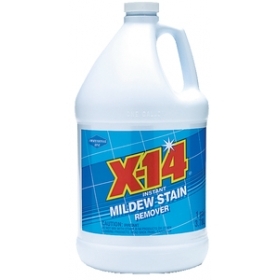 I purchased the X14 to clean the mold off of my canvas in my camper tent beds. The 1st shipment got damaged and never made it to me, but when I called customer service they promptly resent my order even before recieving the returned damaged goods. (nocost to me) This product had been recommended by a friend, so I was very disappointed when I realized that it contains bleach and bleach is a big no-no in the camper. I decided to try it on our white patio plastic chairs that were black. My husband snickered at the instructions to spray on, wait 15 min & hose off. The joke was on him. Product worked like magic removing 95% of the black without any effort. (I just hosed it off in the driveway.) I was confident that a 2nd spray would remove the final 5%, unfortunately it didn't make a difference,but we were given the chairs 10 yrs ago from my inlaws because they were impossible to clean, so the part that didn't come off has been allowed to grow on the chairs for over 10 yrs. After trying virtually everthing on my camper, I relented and used the X14. Again, it worked like magic. (I unbucked the tent beds and brought a hose into the camper so that I could run the water over and over the tent beds while alowing the water to run out of the camper to get the product rinsed out and I followed up with a waterproof sealer that I got from a camping store. I also protected the base of the beds with a clear plastic shower liner.) I highly recommend this product and I can't wait to see what else it works on. Make sure you wear old clothes because it will bleach out anything it comes in contact with. This is the best product I've ever used to clean mold and mildew from bathtub tile and toilet bowls. "I was little skeptical with ordering gas supports for my Tige Ski boat. Couldn't find much..."
"The ordering process was easy and simple. I got my order quickly and without any problems. I..."
"clear website, good prices and fast response and delivery."